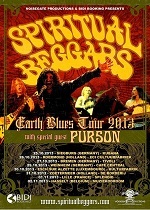 Rocktopia - SPIRITUAL BEGGARS – Tour in October with PURSON; Re-releases announced! 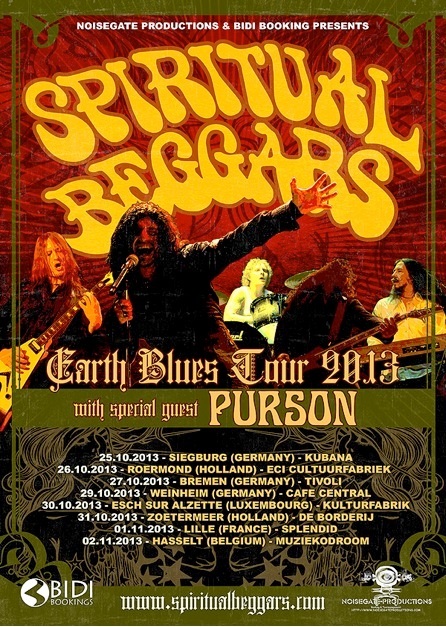 SPIRITUAL BEGGARS – Tour in October with PURSON; Re-releases announced! Just in right time for the upcoming tour, SPIRITUAL BEGGARS will be re-issuing two of their classic catalogue titles on October 14th, 2013: The band’s 2005 “Demons” album will be available for the first time ever on vinyl via InsideOutMusic and additionally also the band’s acclaimed and hard-to-find debut album, the self-titled “Spiritual Beggars” from 1994, will be re-released with over 70 minutes (!) of unreleased bonus material via Century Media Records. Look out for more details about these titles soon. Next to the standard CD and Digital Download versions, the newest SPIRITUAL BEGGARS album, “Earth Blues”, is also available in Europe as limited Mediabook 2CD and as Gatefold 2LP (black, brown, splatter or blue options), both including the 8 live-tracks from the band’s “Return To Live” Mini-Album, which were never previously released outside of Japan, as bonus.